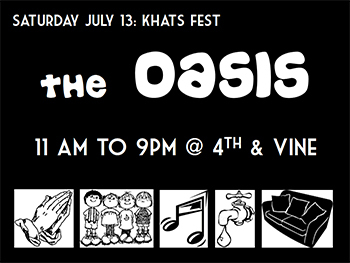 The Church at the Hollywood will be in the thick of things at the Khats Fest July 13, as they were at Greek Day in June. They have been active in the Kitsilano community for many years, but never more than since they took possession of the old Hollywood Theatre last fall. Some Church at the Hollywood musicians will be among those playing throughout the day. 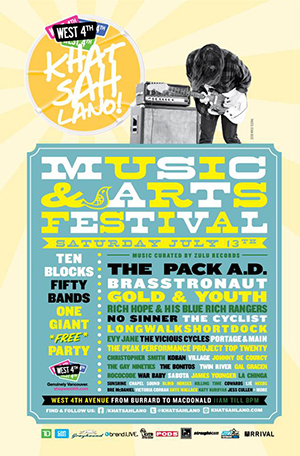 Kift adds, “Our very own Victoria Carbol won a spot to play a full set at the festival this year, so catch her amazing voice on the main stage.” And Bre McDaniel will be onstage at 4th and Cypress at 11:30 am; Zulu Records will be selling her EPs.